The Ohio State defense — while gashed consistently throughout the night — stepped up when it counted and made huge plays to lead the Buckeyes to a win over No. 15 TCU on Saturday night. The game in Arlington, TX — billed as one of the top Week 3 games — did not disappoint, as two good teams played good football throughout the game. The Buckeyes opened the scoring with a short field goal after they couldn’t punch it in the end zone following a long completion to Austin Mack. They then followed it up with a controversial defensive touchdown a few drives later, as a Nick Bosa sack forced a fumble that was recovered in the end zone. Replay appeared to show a Buckeye touching the ball while out of bounds before it was recovered, in which case the play should have been a safety. The play was not reviewed, however, so the touchdown stayed for the Buckeyes. That, in short, is really the story of this game. Each offense mostly moved the ball at will, but the Ohio State defense just came up bigger on the biggest of plays. Each team racked up over 500 yards of offense- Dwayne Haskins threw for almost 350 yards for Ohio State, while Shawn Robinson also threw for over 300 for TCU. It was Ohio State’s two defensive touchdowns that proved to be pivotal. The aforementioned fumble recovery came in the first quarter, while defensive lineman Dre’Mont Jones intercepted a shovel pass and returned it for a touchdown to give Ohio State its first lead of the second half. TCU had taken the lead in the second quarter on a school-record 93-yard touchdown run by Darius Anderson. On TCU’s drive following the interception return, a badly-handled snap on a punt led to the Buckeyes taking over on the TCU 24 yard line. The Buckeyes followed that with a touchdown pass to K.J. Hill on the ensuing play. TCU scored a touchdown on the ensuing drive, but the Buckeyes answered with a touchdown and no one scored since. There’s a lot coming out of this game that will be of concern for Ohio State fans. First and foremost is the health of star lineman Nick Bosa. Bosa is a potential No. 1 overall draft pick, but he left the game early in the second half with a groin or lower abdomen issue. Also, for the second game this season, the Buckeyes’ secondary looked very suspect. TCU managed to throw over the top and receivers were able to win a lot of 50-50 balls. Trouble with the linebackers and secondary let the Horned Frogs make several huge plays. And, of course, suspended head coach Urban Meyer returns next week. All eyes will be on the differences in Columbus with him back at the helm. Will the issues in the secondary get fixed? What about the consistent low snaps? 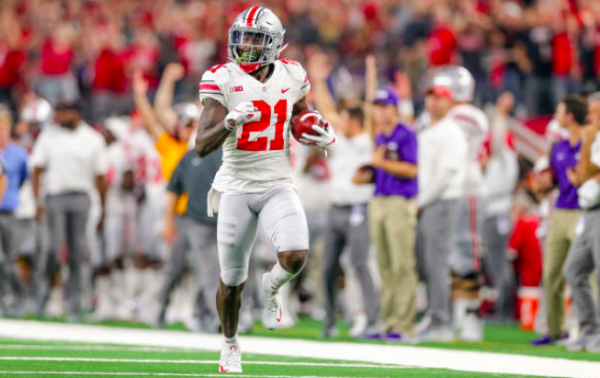 TCU exploited an obvious flaw with Ohio State’s kickoff coverage; how will Meyer address that? Everything will be different moving forward for the Buckeyes. The only question is exactly how. TCU will be disappointed to not come away with a win, but this won’t be debilitating. The Horned Frogs looked strong against a consensus potential Playoff team. If TCU gets through the season with no more losses — or maybe even with one loss — the Horned Frogs will have a serious Playoff case.